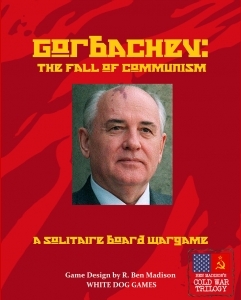 Gorbachev: The Fall of Communism is a solitaire strategy game covering the collapse of the Soviet Union (1985-91), designed by R. Ben Madison. chaos you face is Gorbachev’s fault in the first place. And you’ll even learn two Russian words: “Pravda”, the newspaper, which means ‘Truth’) and “Vremya”, the TV news, which means ‘Time’) – both of which are important features of the game!